Seriously, isn't composting bizarre? Who would think it would work? And here's cup #2, after a year and a half. So honestly, I'm a little disappointed with the "Greenware" people. I'm looking forward to the improved 200% compostable product. I bet it would rot in Arkansas! Bio-based plastics are often touted as “biodegradable.” But this term has several stipulations behind it. While these products may in fact have components that are capable of degrading, this process only occurs under specific conditions and biodegradable plastics cannot be composted in a backyard compost pile. Because the material requires very high heat, these plastics can only degrade in a commercial composting facility. You know, I'm OK that our household's capacity for degradation isn't up to commercial standards. Yes, Calico, these plastics can only degrade in a commercial composting facility. Call me crazy, but I find this a rather fanciful definition of "100% Compostable." I think you should write a sharply worded letter to the Greenware people. Or to the news. I'm actually serious about this, all the vendors at the farmers market & saturday market are switching to 'compostable' products... but if they don't actually compost, what's the point??? It's a rip off. This got me googling and I ran across a discussion of the difference in perception between what consumers think compostable and biodegradable mean, vs what companies mean when they use those terms. Have you ever heard of BPI? 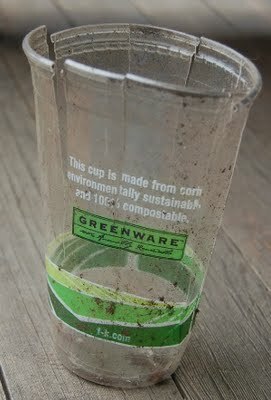 Supposedly items that carry their logo should be compostable in the manner that consumers expect. Some people have called my blog a compost heap of useless crappola, and I resent that. I guess I have an uncluttered life/mind as I do clearly remember this cup. It pisses me off that it is a blatant lie. Clearly, the cup does not decompose naturally. That should be illegal. There's pretty much nothing that can't be degraded given "specific conditions." "Oh yes, this is fully biodegradable, provided you cast it into the sun." If you'd had an equal quantity of plutonium on your compost heap it would be more degraded than that. The Canadians are at the Gates! The 5000s at War: "Rivals of Catan"
Michael 5000 vs. The Beatles: "Please Please Me"
Element of the Month: Nitrogen!